BF Homes, Parañaque just keeps getting better! 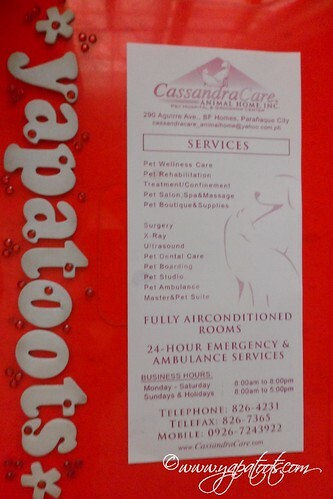 In my village newsletter recently I found a flyer for the Cassandra Care Animal Home. At the time I got it, they were offering (if I read it right!) free rabies vaccinations for dogs in our village. Unfortunately (or should I say fortunately) I had already gotten Bubba’s shots updated. However, because they offered ambulance and emergency services for pets, I tacked the flyer to my refrigerator. Today, as I waited for my lunch to heat up in the microwave, I stood by the ref and read it. 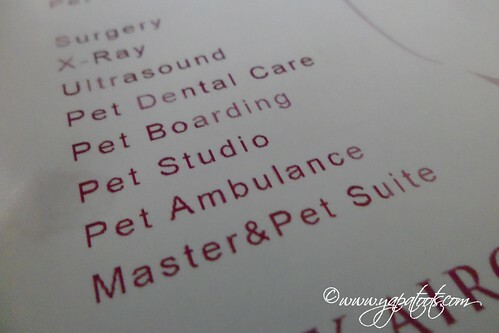 And the magic words popped out: “Pet Studio” and “Master & Pet Suite”. For those who are my friends in Facebook, you may recall that just the other day I posted a shout-out that I was hoping for a “My Pet and Me” photo shoot. However, given my limited funds right now, it’s not a priority. blog, you know how important Bubba is to me, right? I have been longing to find a hotel where pets are allowed, so seeing the Master and Pet Suite in the flyer was interesting to me. However, as I read their website I think it’s more for confinement purposes (i.e. pet operation) rather than a hotel, although their website describes the facility as “a place for your pets to recover from illness and surgery, as well as a second home for your pets while you are away” . Nonetheless, it’s great to know there is a dog hospital nearby where I can stay with him if necessary. Every pet needs a thorough cleansing/bath and a haircut, and occasionally, a relaxing massage. Our pet Jacuzzi will pamper your pet even more. This entry was posted on Sunday, June 13th, 2010 at 1:49 pm	and is filed under pet care. You can follow any responses to this entry through the RSS 2.0 feed. You can leave a response, or trackback from your own site. Bubba’s so lucky he has you.